As our parish continues to grow, it is essential that we plan prudently in order to meet our community’s future needs. As part of this process, parishioner forums were held on April 11 & 12, 2019 to share the parish’s Master Plan and solicit input as we begin our planning for the next phase. Our parish has experienced significant growth since its opening in 1999 with only 18 families. 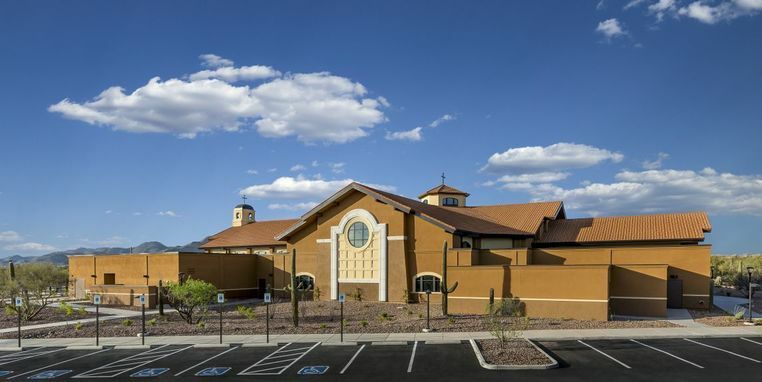 The presentation given at the parishioner forums is shown here and provides an overview of the growth in the communities of Oro Valley and Marana as well as at St. Mark. This growth is projected to continue well into the future. As we approach 1500 families, with more than 300 youth in our Religious Education, Edge and Life Teen programs, increased mass attendance and more use of our existing facilities, it’s critical that we plan now. The parish hall, built in 2001 and constructed of several modular units, has a lifespan of 20-25 years and gets extensive use. At times our church is at or near full capacity for weekend masses. These increases have also come at a time when we have fewer priests. One of the steps in this planning process is to solicit your input. We invite you to provide us with your thoughts and ideas. Please tell us what you think is important. We will be consolidating these suggestions and submitting the information to our architect who will provide us with a conceptual design before the end of this year. To submit your ideas simply fill out this online form, provide us with your email address and hit the submit button. You’ll receive an acknowledgement that your comment has been received. Your suggestions will be private and will not appear online.